A must read for any Shadow fan! The Shadow was first a radio play character and then starred in his own pulp magazine, which ran for more than 300 issues. On the radio, he was Lamont Cranston wealthy young man about town who used hypnosis to cloud men’s minds. In the pulp magazine, he was more of a person who used various tricks to blend with the Shadows and remain concealed in places that seemed impossible. In the 1994 movie starring Alec Baldwin, the Shadow was a combination of the radio character and the pulp hero. When the Shadow reached the world of comics, it was as this blended character. The Shadow was the merciless foe of organized crime, a creature of the night with a shuddering laugh and blazing 45’s. He used the hypnosis to vanish or make crooks believe he was somewhere where he was not. He also used hypnosis to gain needed information or to cause someone to forget something. The Shadow was not Lamont Cranston. There was a real Cranston who allowed the Shadow to use his identity, his fortune, and his New Jersey mansion. He also appeared as others, notably as Fitz the janitor at police headquarters. And again there was a real Fitz so the Shadow had to time his charades carefully. This book is the imagining of how The Shadow first came to New York to wage war on crime. He begins to gather is agents, including Margo Lane. He has come to fight crime and to find an old enemy and fellow mystic Doctor Zorn. 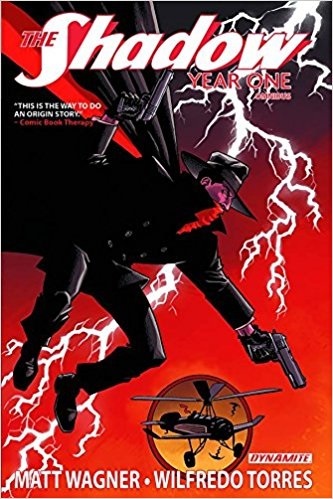 I feel that any fan of the radio show or the Shadow Pulp Magazine will enjoy this graphic novel very much. The art is fabulous and the script recounts the story excellently! It is like the radio and pulp Shadow coming to life on the page! I recommend it to all who know and love the Shadow! This book is worth five stars plus!